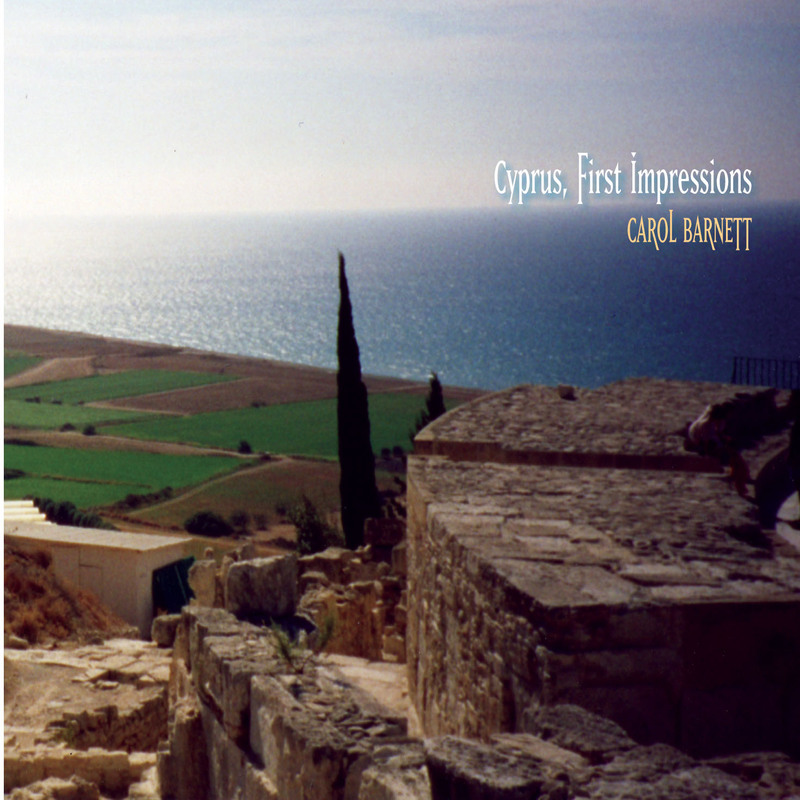 Cyprus: First Impressions is a sonic scrapbook of composer Carol Barnett’s trip to Cyprus in the fall of 1999, and an affectionate homage to Theofanis G. Stavrou, Russian history professor and director of the Modern Greek Studies Program at the University of Minnesota. Liberally laced with elements of Cypriot folk song, Barnett’s music mirrors the moods evoked by its various literary influences--love for a favorite aunt, the joy of setting out on a journey, loneliness and the loss of friends, and the deep and intractable divisions of the island. The title work, for alto flute and strings, is a collage of Nicosia street sounds: ice-cream vendors, muezzin calls from the minarets, the ubiquitous Cypriot wedding song. A book of descriptive sketches by Cypriot author George Philippou Pierides is the inspiration for the three-movement flute/cello/piano trio Vignettes, After Pierides. Ithaka, for baritone and guitar, is a setting of Constantine Cavafy’s poem of the same name. With a poem by modern Greek poet George Seferis, it also serves as the inspiration for Mythical Journeys, for flute and guitar. Fantasies on four Greek Cypriot folk songs comprise the Cyprian Suite for concert band. Performers include members of the Minnesota Orchestra, the University of Minnesota Symphonic Wind Ensemble, and some of the best freelance musicians in the Twin Cities. Barnett teaches composition at Augsburg College in Minneapolis. Cyprus: First Impressions is a sunny emotional expanse where one is free to lose oneself. United States composer Carol Barnett (member of the American Composers Forum and composition instructor at Augsburg College in Minneapolis) has published this convincing collection of luminous movements inspired by Cypriot and Greek traditions and covering the time from 1991 to 2002. The sunny frescos are realized by various performers (from the University of Minnesota and other associations). Disregarding the dismaying New Age-influenced cover, what we find is an intriguing and fragrant collection of unexpected and agreeable listening with a Mediterranean flavor (a rare quality in endeavors of this kind...) The genuine love that Barnett feels for the Balkan traditions yields a deeply felt and evocative series of ideas, strongly visual, in which musical and literary references from Greece, Cyprus, Turkey and Serbia are effortlessly interwoven. There is an ongoing calm and dreamy sense which rises like delicate little clouds to cover the hot and intense rays of the August sun in the first hours of the afternoon, when everything seems to stop and dissolve itself into a suffocating embrace. Cyprus: First Impressions begins with the call of the muezzin from the Turkish quarter of Nicosia, which is superimposed over the shouts of the fruit vendors of the enchanting old city; the contemplative sense of suspension woven by the alto flute reflects the inextricable hardship of a deeply divided country. An enveloping cinematic capacity, an attenuation of the thread of remembrance in the service of an inner meditation, moving and respectful. Mythical Journeys, composed in 1991 under the influence of the Greek writers George Seferis and Constantine Cavafy—a touching slow-motion between guitar and flute where in the rarified pauses there pulses an indescribable sadness, a sense of loss of identity. And then all breaks out in instantaneous revelry, the tension relaxes, evening falls. Cyprian Suite takes leave of us in a bittersweet manner, caught at sunset with glass in hand while noticing the gowns of the women being lifted with the impetus of the dance; the faces that brighten in a smile; it binds us all together in a single vital heartbeat that does not recognize ideological divisions of any sort. Anyone who has enjoyed the charms of “Koan” by Stephan Micus may approach without fear. But not only they. We are all invited. Every artist must take a journey to find his or her self. American composer Carol Barnett comes to us now with pictures of her journey, which involve both metaphorical and literal travels to the eastern Mediterranean, an area where she has found a music that resonates within her, inspiring vivid and accessible compositions. .....The recorded sound for this album is quite handsome....Timbres are caught both cleanly and alluringly, framing each piece attractively. The band numbers are recorded in a more spacious hall, but conductor Craig Kirchhoff’s careful balances keep everything sorted out.